While designing bridge structure, different types of loads are taken into consideration. The protection of the bridge construction throughout its use under all situations is mainly dependent on those loads and their combinations. 1. Dead Load: The dead load stands for a self-weight of the bridge components. The various components of bridge range from deck slab, wearing coat, railings, parapet, stiffeners and other utilities. While creating the design of bridge, it is considered as the first computable design load. 2. Live Load: The live load on the bridge belongs to the moving load on the bridge all through its length. The examples of moving loads are vehicles, Pedestrians etc. But, it is complicated to choose one vehicle or a group of vehicles to design a safe bridge. IRC Class A Loading: This type of loading is applicable for creating the design of all permanent bridges. It is treated as standard live load of bridge. While designing a bridge with class AA type loading, then it should be examined for class A loading also. IRC Class B Loading: This type of loading is applicable for making design of temporary bridges like Timber Bridge etc. It is treated as light loading. 3. Impact Loads: The Impact load on bridge occurs because of sudden loads which are produced when the vehicle is moving on the bridge. When the wheel is in motion, the live load will alter occasionally from one wheel to another that produces the impact load on bridge. 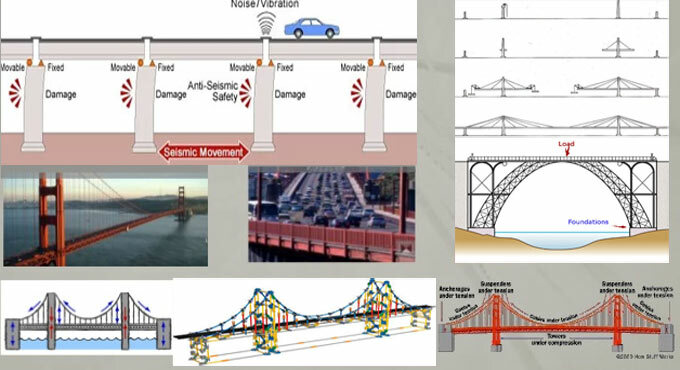 The impact loads on bridges are assessed with an impact factor. Impact factor stands for a multiplying factor that is based on several factors like weight of vehicle, span of bridge, velocity of vehicle etc.